Great as a side dish or dessert! Delicious and easy, this salad combines all of my favorite sushi ingredients in one bowl! And, because it's based on a California roll, it uses fully cooked seafood. Tender spinach and sweet pears are drizzled with tangy vinaigrette, then topped with rich blue cheese and crisp red onion for a salad you'll love. Take this easy fruit salad to your next pot-luck for a big hit! Or, make up a batch and keep it on hand for a healthy snack or "sweet fix". 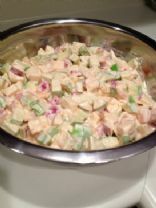 I hope you enjoy my cucumber and onion salad in vinegar recipe! A lightened-up version of a classic lunch dish. I love the versatility of this salad,and the ease in making it a delicious side dish,or meal.My children are grown but they still ask for this dish at family gatherings.It's great for picnics because it is not mayonaise based.I hope you and your family enjoy it as much as us. This high-fiber, high-protein, low-fat salad travels well. This salad uses fresh spinach and seasonal berries. It tastes good and is very healthy. Wakes up your taste buds. Watermelon is a favorite summer dessert, but it makes a lovely salad, too. Here, creamy citrus dressing pairs with the sweet melon and crunchy celery. Great salad or chunky salsa. Eat as a side salad or add two grilled scallops and a slice of grilled whole-grain bread for a meal! Tasty salad with cucumber, tomato, onion, and vinegar. Depending on how small you chop the veggies, this light summer side can be a salad or salsa. Pair the salad with grilled chicken or shrimp. As a dip, opt for endive, jicama slices, or lime tortilla chips. Crunchy almonds, creamy avocado, and crisp arugula pair perfectly with smooth and sweet mango in this simple salad.